The Gray Report: Does the terroir of Salta, Argentina have a unique taste? Does the terroir of Salta, Argentina have a unique taste? Argentinian Malbec continues to sell well in the US basically as a cheap, big red wine. The danger for Argentina is that it will fall into the Yellow Tail trap, where nobody here respects the country for anything else, and wineries struggle to sell their products for more than the lowest supermarket price. The US matters because not only are we the world's largest wine market; we are far and away Argentina's largest export market, and we are the only country likely to pay a premium for its products. Argentine vintners understand this and will tell you that the challenges for the country's wine industry are 1) to introduce Americans to other grape varieties, and 2) to explain that terroir matters for Malbec. The latter is tricky. Malbec is not the most interesting red grape in the world, even if it does thrive in the desert soils of Mendoza. 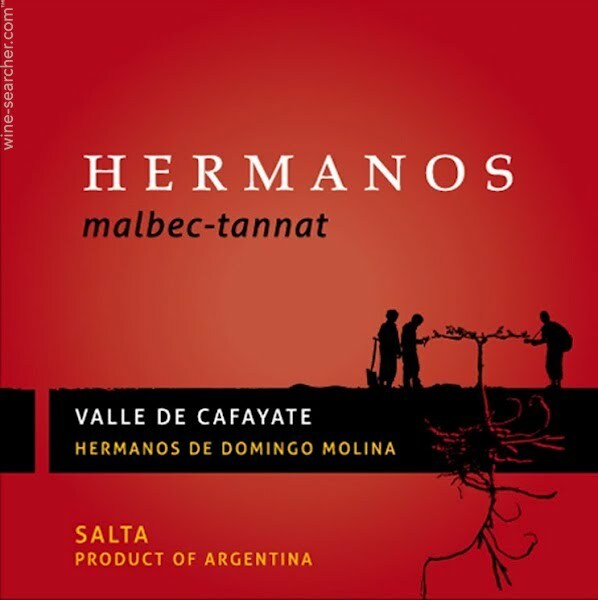 Moreover, I'd be interested in a survey on why American drinkers choose Argentine Malbec. Are the customers people who will sometimes buy a $35 Pinot Noir and know the difference between Willamette Valley and Russian River Valley? If so, that's ideal, because if you could demonstrate that Malbec from one part of Argentina tastes different from Malbec from another part, you start creating a premium market for enophiles. But what if most Malbec customers just want a wine that tastes like red? My friends at Vine Connections, an importer that oddly concentrates on Argentine wines and fine Japanese sakes, invited me to taste some wines from Salta, Argentina, as part of the general push toward proving that terroir matters in Argentine Malbec. I said, "Yeah, that's interesting." Salta is in northern Argentina, and supposedly has the highest-elevation vineyards in the world, higher even than the deserts of Mendoza. The temperature can change 50 degrees in a day, which is great for maintaining acidity, but does complicate farming. It produces only about 1% of the wine in Argentina, much of it Torrontés, but its reds are well-respected by Argentine wine cognescenti. At the risk of sounding ungrateful for free wine, Vine Connections didn't really send me enough wines to make any kind of statement. I got four wines from Salta, three of them blends, from two vintages. I sighed and put the wines in the back of a closet. I was straightening up the other day and came upon the wines, and realized that there's never going to be a day when I just really feel like drinking a Salta Malbec-Tannat blend, so I better pop the corks and taste them. Betteridge's Law of Headlines states that any headline that asks a question can be answered with the word "No." Well, I'm breaking the law here, because my answer to "Does the terroir of Salta, Argentina have a unique taste?" has to be "I don't know." Which begs the question of why I'm bothering to write this blog post. Two reasons: 1) The base topic itself is interesting, the struggle for Argentina to expand its market recognition in the States, and I haven't written about it in seven months. 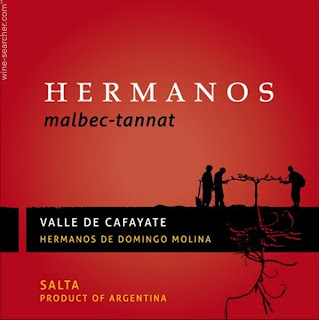 2) Though this may not be what Argentine vintners want to hear, I usually find that I like affordable Malbecs -- in the $10 to $20 range -- much better than very highly priced stuff, and I get another chance to say that here. The irony is that of the wines in the closet, the one that I feared I'd never feel like drinking -- the Malbec-Tannat blend -- that one was delicious. And it was the cheapest. So there's a happy ending for me and you, dear consumer, if not quite for the Argentine wine industry. The Domingo brothers make this wine from vineyards 5800 to 7300 feet above sea level. The Tannat (30% of the blend) adds depth and length to the wine, giving it some savory notes as well as black plum. Smells fairly ripe, with black plum and black licorice notes, but is well-balanced on the palate with good freshness. I really like the long finish. 14% alcohol. 90 points. Buy it here. The Tacuil Valley is 8626 feet above sea level on the flanks of the Andes. Though it's only 20% of the blend, you can really smell the Cabernet Sauvignon in this wine, which has plenty of fresh herb, so much that the black cherry fruit is submerged. It's an interesting note in the wine and I wonder if it was added to balance out the very ripe Malbec; the wine is 15% alcohol. It smells a little of Bordeaux while tasting voluptuously South American. A little oaky on the finish. I think this is a better wine to taste than to drink. 85 points. I threw this one in to see if I could taste the difference between Salta and Mendoza. Fools' errand, but I wanted to taste this wine made by Clos du Val's Bernard Portet anyway. A restrained version (13.9% alcohol), as you'd expect from Portet, which tastes surprisingly acidic on the finish. Red plum fruit that's pretty straightforward, but it passed the empty-bottle test at dinner later. 87 points. Blake, thanks for tasting through the wines. Obviously we think there is a pretty big difference between the profile of Mendoza versus Argentina. For me, it is mouthfeel (more taut in Salta), fruit profile (more red fruit than black fruit), and acidity (higher in Salta). Next time we'll send a better comparison -- that would have been the right approach. (Full Disclosure - I am the importer for Hermanos, Finca Las Nubes, and Tacuil wines). Blake - One curious note -- you commented on the Tacuil RD that the taste was “A little oaky on the finish.” Well, this winery uses zero oak in their wines. Yes, 3 wines at SRPs of $45, $70, and $100 that all have no oak aging. My point is that the flavors you are getting in the wine are distinctive to the area and not to the winemaking. You are not the first person to perceive oak-like flavors in these wines, but it is the unique set of elements at 8600 feet elevation and in this remote area of outer Salta that produce this flavor profile. They are also off the electric grid, use only wild yeast, etc.--Raul Davalos, Sr. likes to say that everything in the wines of Bodega Tacuil comes only from Tacuil. Terroir indeed. Thanks Ed. I guess that in a sense I answered the question in the headline, though I didn't realize it.